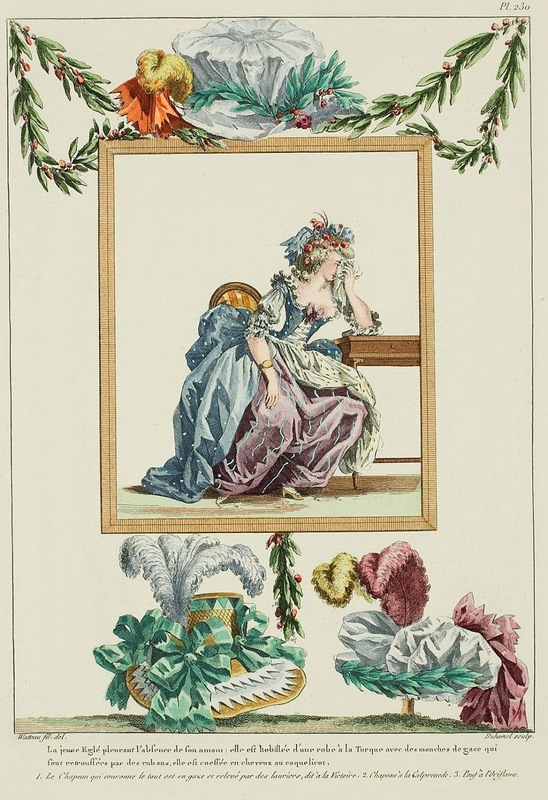 The young Eglé crying over the absence of her lover: she is dressed in a robe à la Turque* with gauze sleeves which are rétroussée with ribbons, she is coiffed en cheveux with poppies. 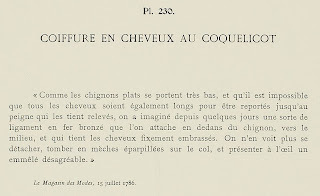 "As the flat chignons are worn very low, and it is impossible that all hair be equally long to be caught into the comb which holds them up, some time ago a sort of ligament of bronze iron was invented that is attached inside the chignon, around the middle, and which keeps the hair firmly embraced. Chignons are seen no more detached, to fall in scattered wisps on the neck, and to present to the eye a disagreeable mat." * It's very interesting that there's nothing much to tie this to the turque as it was originally conceptualized in the 1770s. I speculate that perhaps the term came to mean what we now call a "zone front". ** As far as I can tell, no specific victory was being celebrated. The name is simply due to the laurels. † Probably a reference to Gauthier de Costes, seigneur de la Calprenède (ca. 1610-1663). The Van Dycking and plumes are often used as references to the seventeenth century. ‡ It was difficult to find the meaning of "Oriflame" as the term is now the name of a cosmetics company, but the Oriflamme was the red medieval banner of St. Denis. What do you suppose the "ligament" object is described in the short article? 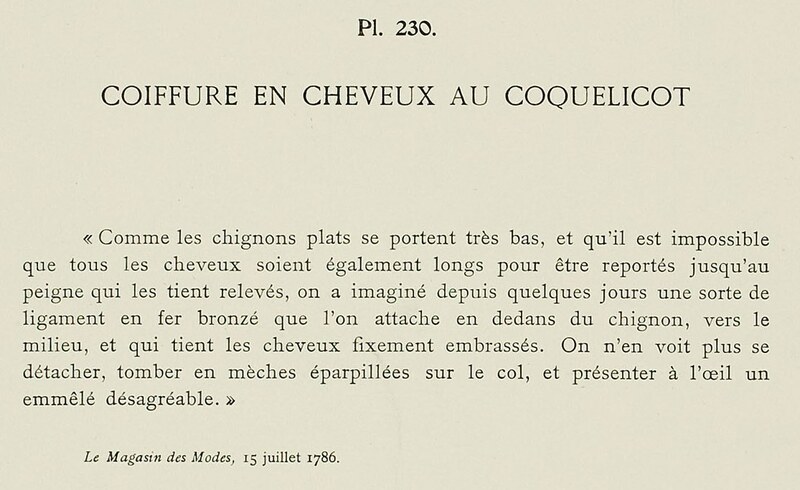 To wit: "some time ago a sort of ligament of bronze iron was invented that is attached inside the chignon, around the middle, and which keeps the hair firmly embraced." A sort of barrette, perhaps? Yes, that's about how I took it. When you think about it, describing the way a barrette works is pretty hard!